To answer this question, Rainier runs on both diesel and STEAM. The diesel keeps this ship running where it needs to go and the engineers are masterful at keeping this ship maintained. 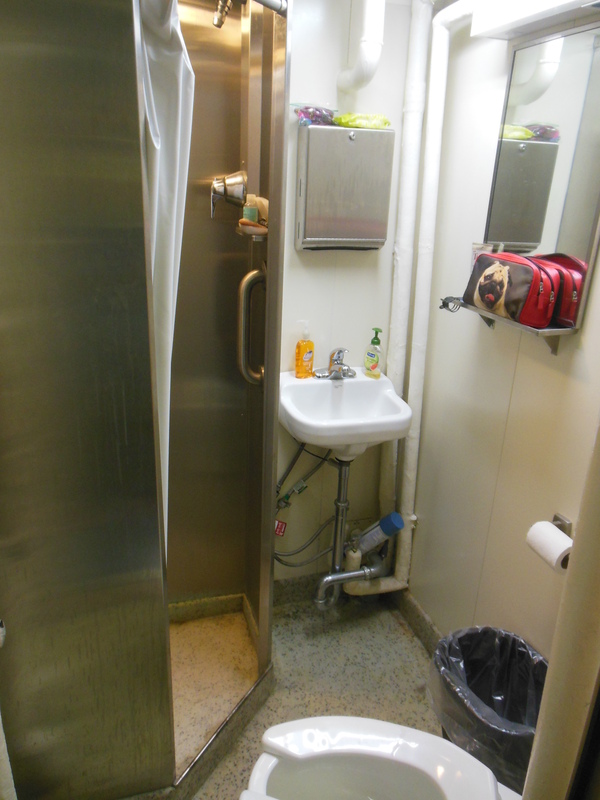 The STEAM is everywhere, and I am not just talking about water steam in a pipe or in the galley. This ship has serious Science, Technology, Engineering, Arts and Math!! I met with acting (Executive Officer) XO LT Adam Pfundt and acting (Field Ops Officer) FOO LT Steve Loy (even though Loy is a unique name, we are not related – but it is pretty cool that another Loy is here). They were discussing who was going to lead certain jobs. I learned a great deal about the process needed. During research, an area in review is called a “sheet”. Why do you think they call the areas sheets and not something else? Do you think there could be some historical mariner significance? Like most tasks on Rainier, research begins with a geographical area being assigned to a manager, assistant plus a mentor. 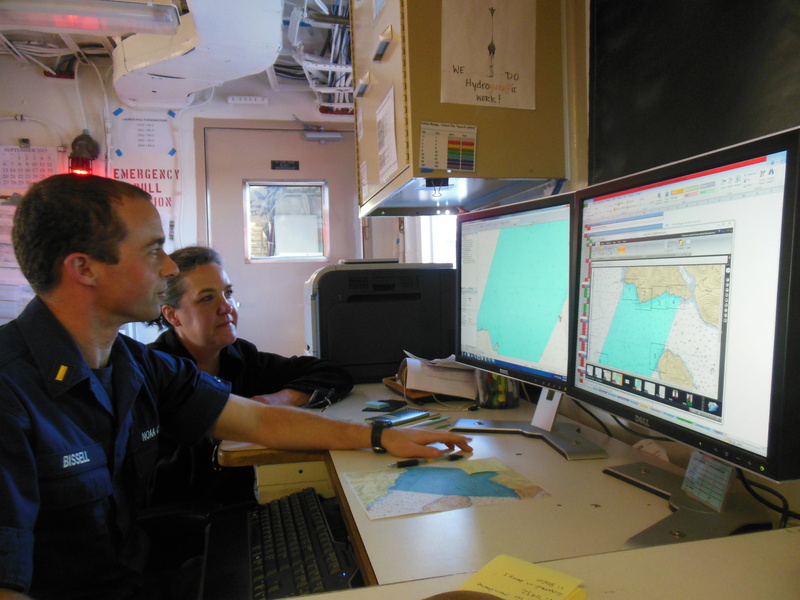 They will work together as a team on their sheet until the hydrographic branch of NOAA accepts the data. Like I mentioned in my second blog entry, this could take weeks or months after the initial data collection to complete. I have decided to use sheet number H12692, which was just assigned to the team of ENS Matt Bissell, manager, ENS Shelley Deveraux as assistant, and LT Steve Loy as mentor this past week. Can you find H12692 on the photo above? Sheet Manager – this is the biggest of the jobs given. The sheet manager is responsible for organizing the team. This person needs to prepare the area to be studied by separating it into more manageable areas called polygon plans. 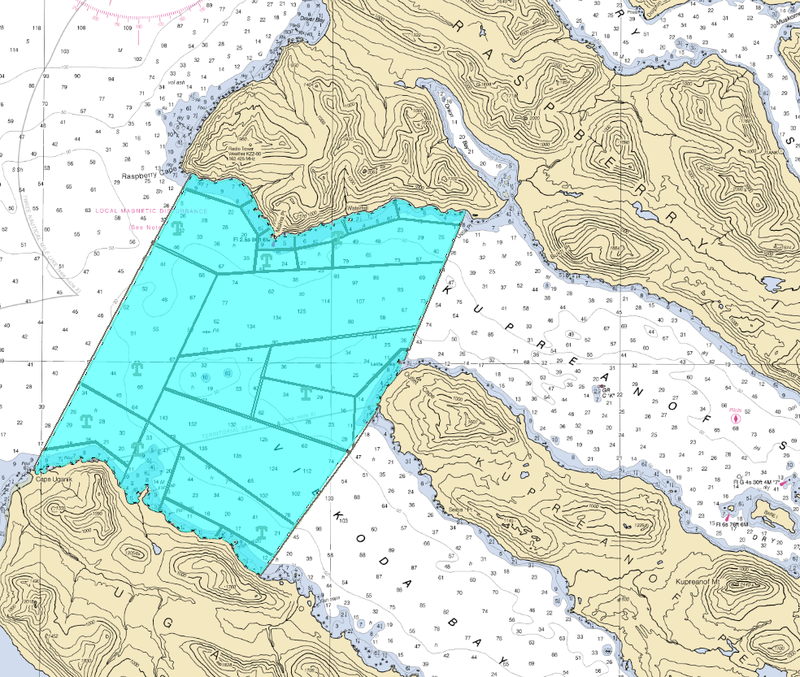 Sheet H12962 in polygon planning. They decide which area gets studied by the large Rainier or if a smaller launch is needed. The smaller launches are good for areas closer to the shore or shallow areas. 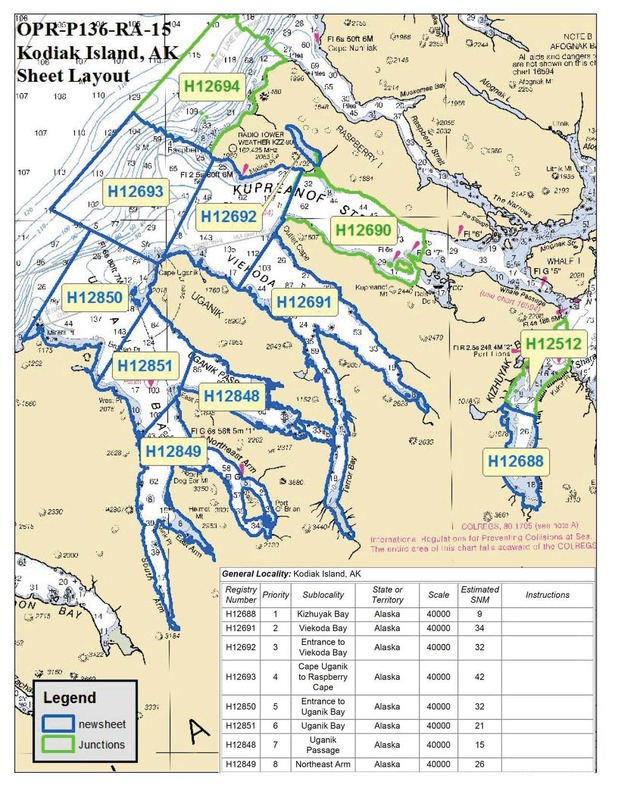 The manager has to know if Rainier should use its multibeam echolocation sounder (MBES) in large runs or drag its Side Scan Sonar (SSS) behind it in the area to be studied. Another option the manager has to decide is do they need to use the MBES or Side Scan Sonars that are mounted on the smaller launches and where should this be. ENS Bissell has a many choices to make to get the best information possible. Looking at the polygon grid ENS Bissell organized can you pick out which areas Rainier will cover? Managers need to attend meetings and review data that was processed the night before. They do this to see if any problems were encountered and if an area needs to be scanned again. 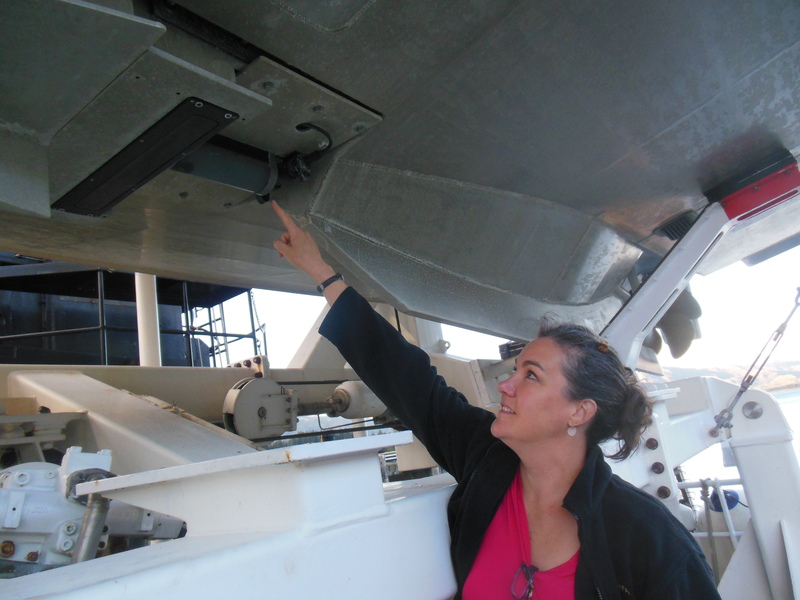 The manager uses the immense CARIS HIPS and SIPS marine data processing program, prepares dive teams if needed, does more reviewing of data and organizes the pilots that take the launches closer to shore. This is truly just a brief overview. Sheet Manager is a very important job. Sheet Assistant – The assistant works very hard right alongside the Sheet Manager. This person is in training as well and will someday be a Sheet Manager. It is important for the Sheet Manager to give the assistant guidance to learn. The assistant needs to ask questions so they can be an effective manager in the future. They need to set up the launches, help with polygon plans, maintain the bottom sample notebook, load charts, assist with data acquisition and follow what the manager needs them to do. Sheet Mentor – The mentor’s role is an advisor to the manager, especially if this is the first time someone is managing. They also train the sheet assistant and work between the FOO and the management team (in this case the FOO is also the mentor). The more the mentor can teach the assistant the easier their transition will be from assistant to manager in the future. Once all of the extensive planning is taken care of, this team begins to collect data. 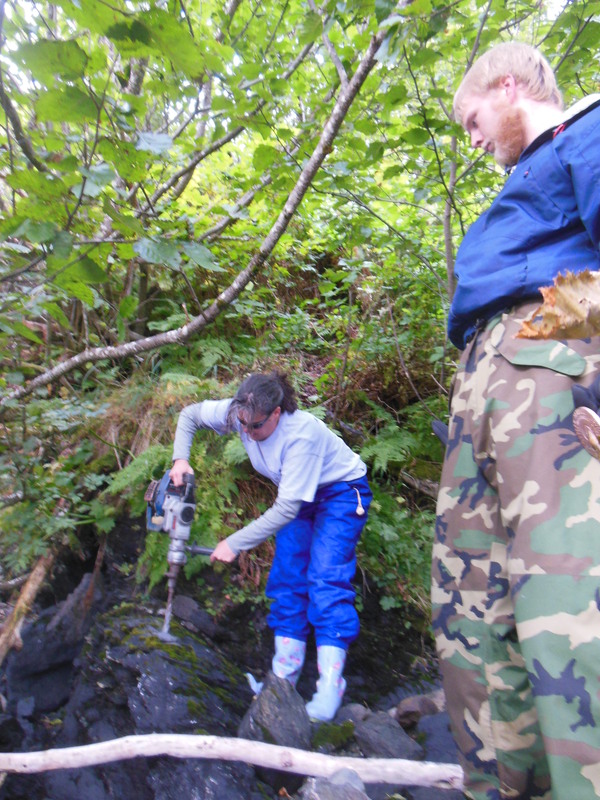 This is the actual field work that Rainier does! I know all of you at school were most excited to hear about this! 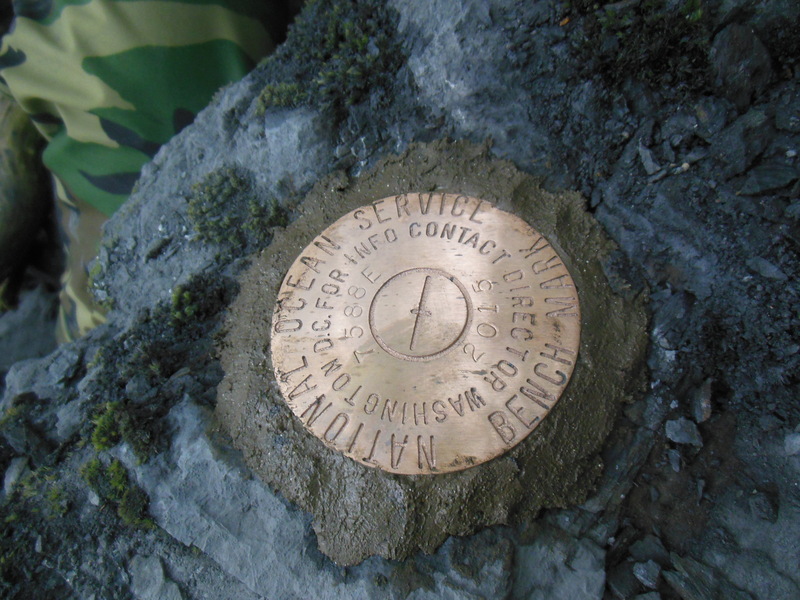 To begin, we went ashore in the South Arm of Uganik Bay, northern Kodiak Island and had to place a tide gauge station. To begin the scuba divers had to place part of the equipment called the orifice under water. This orifice holds air bubbles. When the tide is higher and the water level is high, more bubbles will be pushed out of the orifice letting the system know that the water level is up. The more water pressure on the orifice, the higher the tide level and the opposite is also true. This information is sent to the satellite links where solar panels and batteries keep everything powered so people on the ship can read the data. 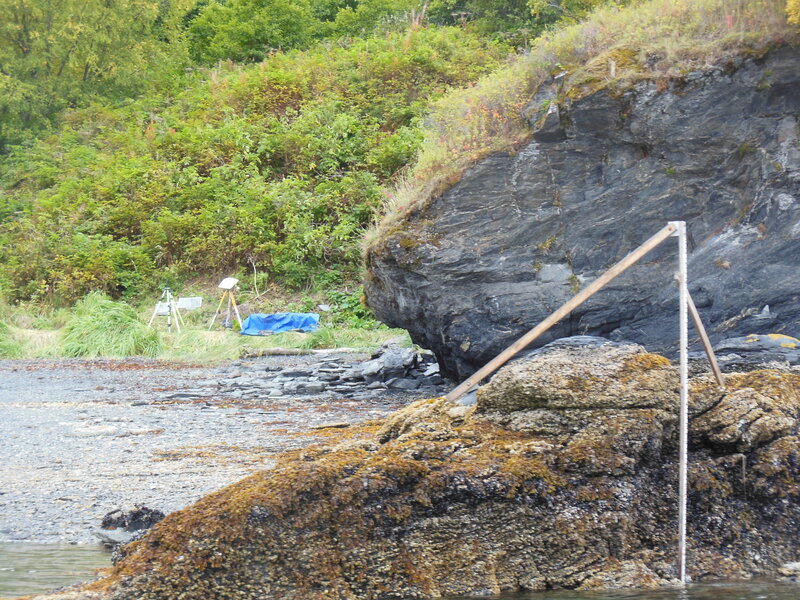 We also had to place tide benchmarks in five different areas near the tide station. I helped with tide benchmark 7588 E or “Echo” which was the fifth benchmark to go in. Due to movement in the Earth, we need to have tide benchmarks throughout the areas we are studying so when the ship returns in 30 days they will have accurate information. I worked very hard drilling into just the right rock to cement it down (I actually drilled in 4 areas before this one, but the shale kept breaking apart, LT Pfundt found this great spot with a more stable rock). Hydrographic Assistant Survey Tech (HAST) Michael Bloom and I made a great team working together. 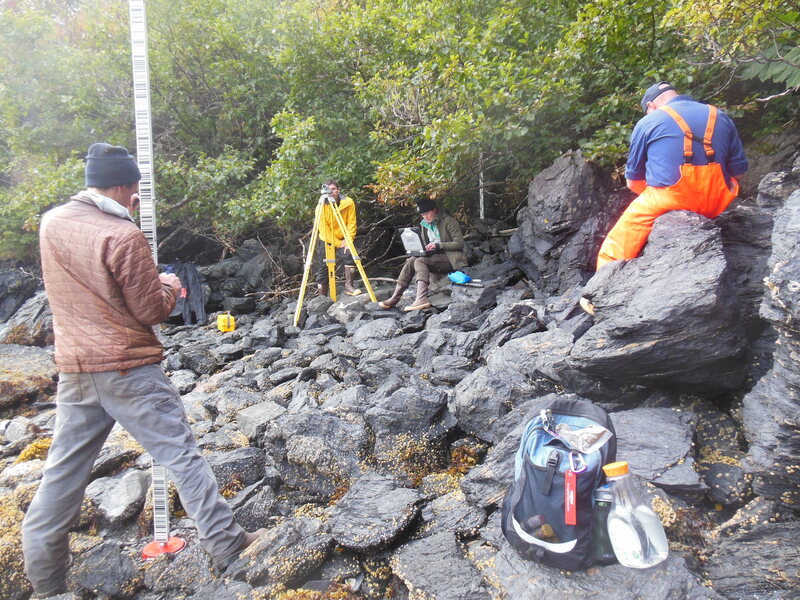 It took 1 1/2 days to place everything, survey and link the systems plus take 3 hours of observations for the tides. During this 3 hour period the observer checks the water level on the staff every 6 minutes. This is a lot of close observation to make sure everything is running properly! Surveying all the tide benchmarks! Do you know why we would need to know when the sea rises and falls? Sometimes it can change over 6 feet in depth – two times per day here in the Pacific!! We need to know the levels for the charts that are being made. The researchers are looking at updating water depths on a chart. They will use the tide level that is lowest to be safest. This will give boats traveling above the best depth for clearance below them. The opposite is true if there is bridge on a chart. The researchers will use the highest tide depth so ships can know if they can make it under a bridge. Knowing tides is very important to chart development! Here is some more information on Vertical Control-Tides. Our finished tide gauge installation from the water. See the tall stick where water measurements were taken every 6 minutes. In the back, are the satellite up-links with the GOES and Iridium data retrieval boxes under the blue tarp. 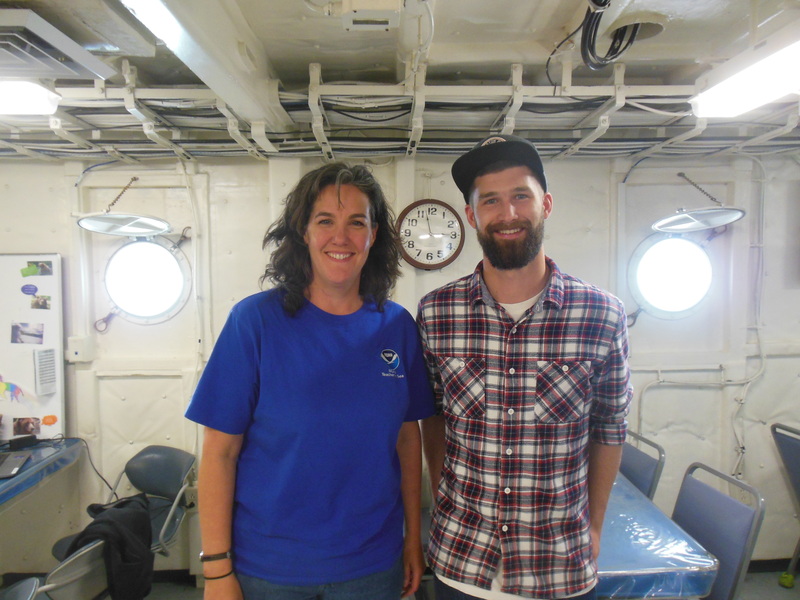 Another fascinating person on board is Hydrographic Survey Technician Eli Smith. Eli has been on Rainier for 1 1/2 years now. He started as a Hydrographic Assistant Survey Tech in May of 2014. Originally, he graduated from Western Washington University with a BA in Geology. I was curious how he went from being a geologist in the oil fields of Denver to working on the ocean. While he was in Denver, Eli would take soil samples. So many samples that he was called a “Mud Logger” which is a pretty interesting term even though Eli didn’t enjoy it very much. He did a lot of “soul searching” and realized he needed to do something else. Between remembering an ocean based field experience in college off the coast of Hawaii and contacting a career counselor, Eli was led to NOAA. He was pleased when he was placed on Rainier. On Rainier, Eli works a great deal up in the Plotting room or in another room called the “Hologram Room” where survey techs also work. Currently, he is a sheet manager for sheet H12691. This sheet includes Viekoda Bay and Terror Bay. You can see his area in the photo above. Eli has been hard at work doing his own polygon plot and preparing plans for his sheet. He is also part of the Tides Team placing tidal gauges in areas that are being studied. When Eli is not working, he has his bike on board and likes to ride that when he can. He is also a hiker and snowboarder. I appreciate Eli spending some time with me telling me about himself and all your help on shore. Thank you! Being on this ship is like being part of a hard working family. People are all over this ship. 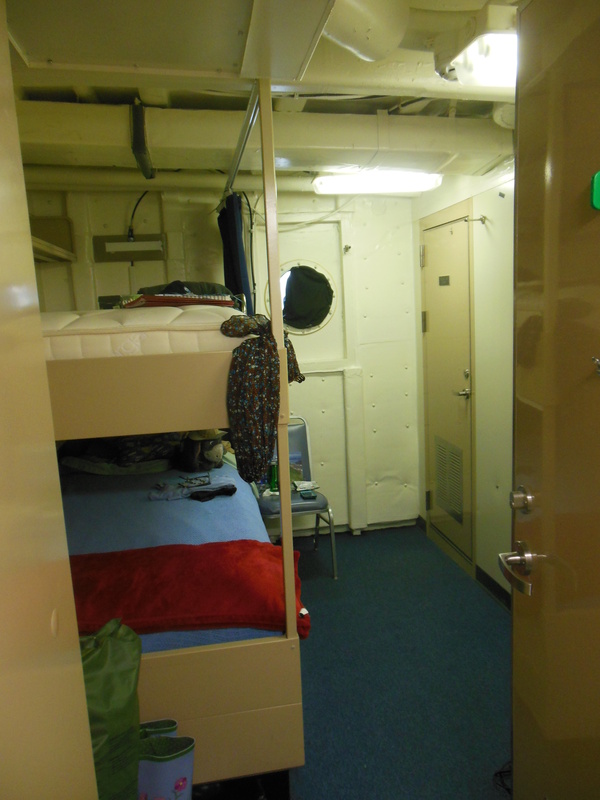 I have come to appreciate the true gift that this crew gave me with my own stateroom, head and starboard side porthole. I even have my own head! Looking into my stateroom from the hallway. I found out the room they gave me is called the “Princess Suite.” I learned this name comes from using the initials PS for the visiting Physical Scientists who often come aboard. I extend an apology to visiting NOAA physical scientist Adam Argento. You will learn about Adam in a future blog. He did not get to sleep in the wonderful “Princess Suite” on this trip. 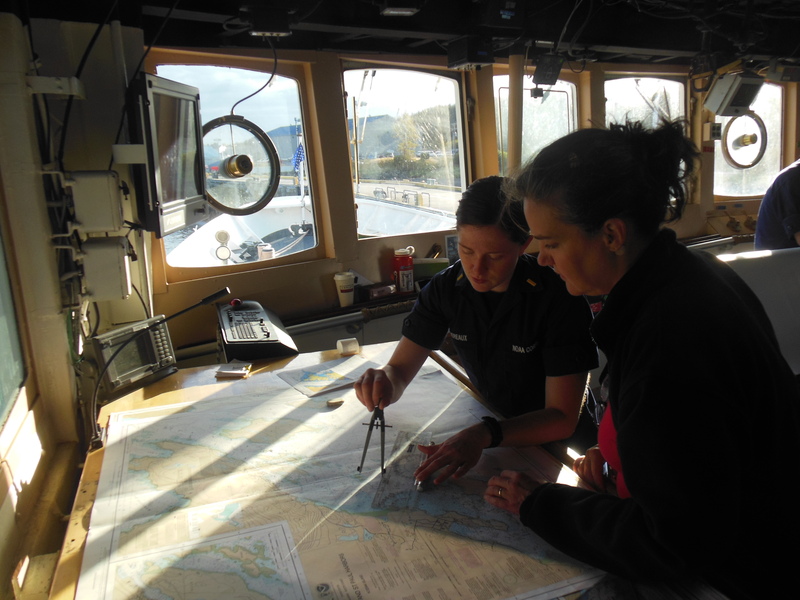 This entry was posted in 2015, NOAA Teacher at Sea, Rebecca Loy and tagged Alaska, becky loy, Hydrographic survey, Kodiak Island, noaa ship rainier, NOAA Teacher at Sea. Bookmark the permalink.